Sydney Harbour is one of the finest in the world and Sydney one of the most exciting cities in the world. At the heart of Sydney lies Macquarie Place with its obelisk which, in colonial times, was the base point for all distances in New South Wales which then covered the eastern half of Australia. From Macquarie Place to Coogee the walking route travels through the most densely populated area in Australia but it is surprising how much parkland remains. The elegant Bridge Street historical precinct gives way to the internationally acclaimed Opera House and the Royal Botanic Gardens with its stunning bridge views from Mrs Macquarie’s Chair. The route then travels via the street-scapes of Kings Cross past the remnants of colonial Sydney at Elizabeth Bay House to Rushcutters Bay and Centennial Park. Centennial Park with its wide open spaces houses the Federation Pavilion where the Australian Federation was proclaimed on 1st January 1901. From these open parklands the route follows the leafy back streets of Waverley to Clovelly and on to Coogee through regenerated coastal reserves. The track then winds along the rugged sandstone cliffs, spectacular coastal scenery and magnificent beaches to La Perouse. The historical buildings at La Perouse provide an insight into early European history while the remnants of the Hospital Cave at Long Bay, the giant middens at Boat Harbour and the rock carvings of the Royal National Park are forcible reminders of the first people, the Eora and Dharawal. Across Botany Bay the route continues through Cook’s Landing Place at Kurnell. The route then runs through Botany Bay National Park with its perched freshwater lagoons and sandstone gorges to the golden arc of Cronulla Beach. From Buxton the track drops down to the Little River and then climbs up to Wattle Ridge along a power line that provides the last view of the towers of Sydney and the Tasman Sea. 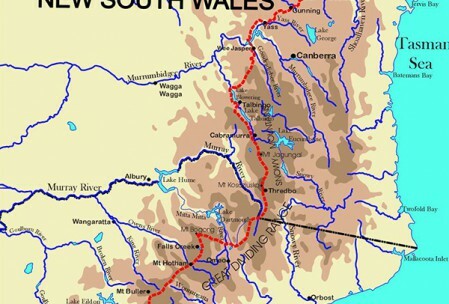 The Track then runs north-west down into the Nattai Wilderness where it joins the Barrallier Track to cross over Beloon Pass with its unforgettable view across the vast Burragorang Valley to brooding Mt Colong. The track drops precipitously down to the Burragorang Valley encircled by sandstone walls and escarpments before ascending to Mt Egan. At Mount Egan, the route follows the historic Slide Track and then veers west to join the Yerranderie Road at Myall Causeway with its views across the Yerranderie Spires to the blue-misted ranges beyond. 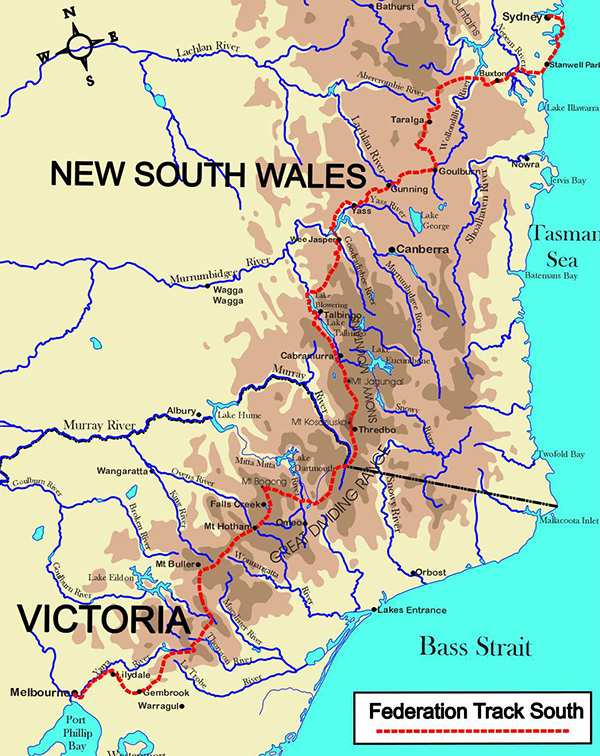 The route then follows this gravel road across the Bindook Highlands to “Bindook” station with its amazing history of hardship, bravery and pioneering in the second half of the twentieth century.